Face Value: Oh HEY Twilight hands! It’s not that it isn’t a good concept – I’ve gone on record saying that I actually think the cover of Twilight is really well done. It’s just that by now it’s so recognizable that it’s become its own kind of cliché. But aside from that lazy choice, I like the cover. The scarab is the focal point, and intriguing, and it nicely reflects both the historical and steampunk content while still feeling contemporary. Does it Break the Slate? 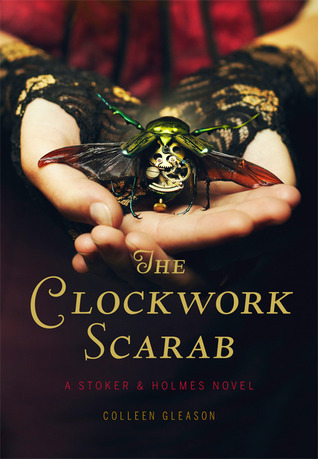 The niece of Sherlock Holmes and the sister of Bram Stoker team up to fight crime? Of course it breaks the slate! Both of our protagonists are Slatebreakers in their own way, and this alternative history gives us a nice glimpse into a way that young women might have taken control of their own lives despite a repressive era. Who would we give it to? Steampunk fans, mystery fans. While no particularly groundbreaking territory is covered in this book it is a sincerely enjoyable piece of storytelling. Review: Young society women are being murdered in London. It’s 1889 – but an 1889 where electricity is illegal and steam runs the world. To investigate these crimes, Irene Adler (Holmes readers will recognize the name) calls upon Mina Holmes, niece of Sherlock with her own skill for observation and deduction and Evaline Stoker, sister of Bram who carries her family’s legacy of vampire hunting. In the meantime, they are also dealing with the mysterious appearance of a young man who seems to come from a totally different world (spoiler alert – it’s our contemporary present). What worked for me was the characters and the mystery. I am predisposed to enjoy this type of thing, a re-imagined history where young women are vital to the storytelling. As a fan of both Arthur Conan Doyle’s Sherlock Holmes and Bran Stoker’s Dracula, a world in which Holmes’s niece and Stoker’s sister play an active role is totally appealing. It’s an engagingly written narrative and fun to read. What didn’t really work for me was the time travel element. It felt weirdly misplaced, like it was part of a different book. I wanted to be consumed by this alternate reality and absorbed into that world, rather than have a character from our modern day thrown into it. Also there is no way an iphone would hold a charge for that long, just saying. Both of our protagonists are Slatebreaking and wonderful. I appreciated that Gleason wrote two different tough, capable heroines who present to the world in really different ways, without falling on overused stereotypes. Mina is thoughtful, deductive, calculating, while Evaline is impulsive and physical. Their initial mistrust of one another that leads to a grudging respect and ultimately a friendship of sorts is well done. While the characters and the setting ultimately were stronger than the plot, which left a bit to be desired, the overall experience of reading was a really fun one. I’m looking forward to watching these character relationships develop over the next books in this series. This entry was posted in Reviews, Young Adult and tagged Bram Stoker, Detectives, Historical Fiction, Mystery, Sherlock Holmes, Steampunk, Time Travel, Vampires. Bookmark the permalink.